I recently purchased an external hard drive for my Macintosh computer and have spent the last few days copying all my backup CDs onto it so that I can now have easier access to all my photos and files. I like to look over the photos especially when I'm feeling dull due to the weather (constant rain these days). 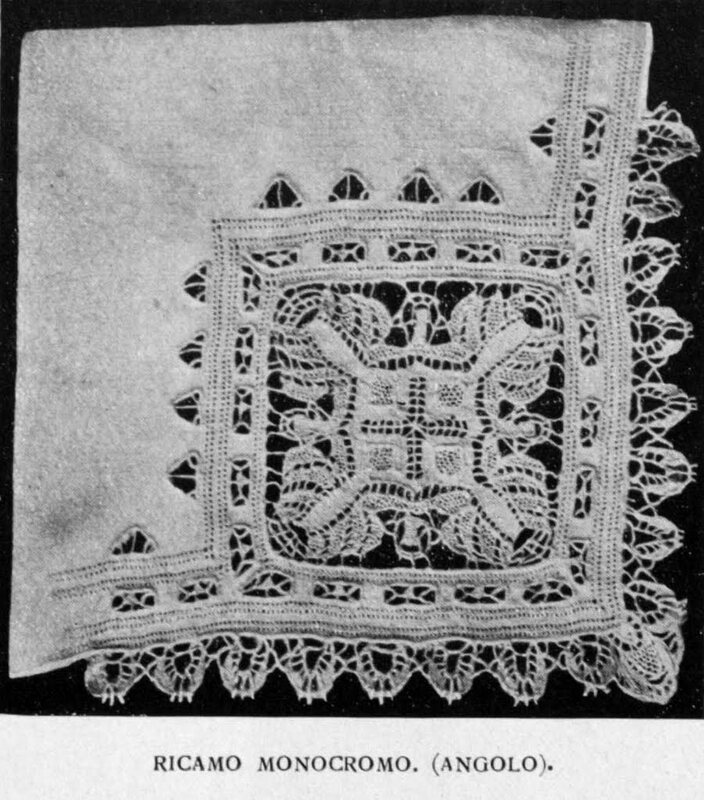 I wanted to share with you a beautiful Whitework handkerchief that I saw at the Poldi Pezzoli Museum last year in Milan. I've made the photos black and white in order to show you more detail at a higher resolution, click on the photos for a closer look. 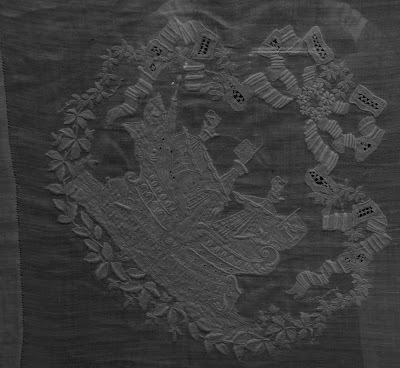 Sorry I was too awestruck to get any historical data on this handkerchief – just means I'll have to go back for another look! Thank you to Stefania for the photos! I love when things are waiting in the mail for me when I get home! 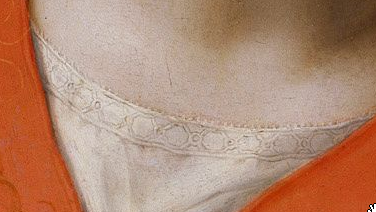 I told you about Punto Perugino or Perugian Embroidery in a previous post. This new book has a variety of patterns for tablerunners, table centres, placemats, curtains, cushions as well as some ideas for smaller items like bookmarks and scissor fobs. 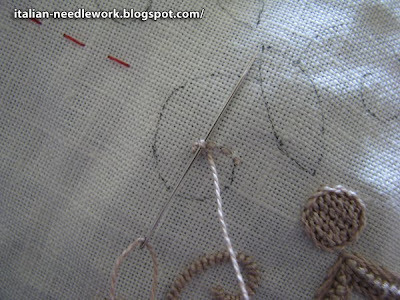 As well as covering the Satin Stitch designs, there are a few other Counted Thread work borders and patterns all with step-by-step photos and graphed patterns. How to treat a mitred corner is also covered. 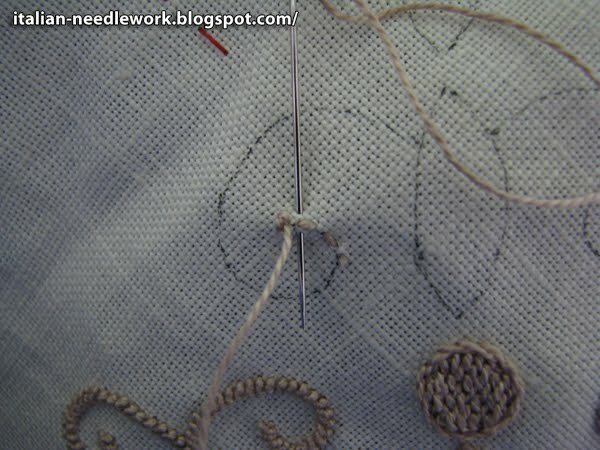 A wonderful Drawn Thread work pattern is explained and there are several ideas of how it may be applied to different projects. The text is in Italian. 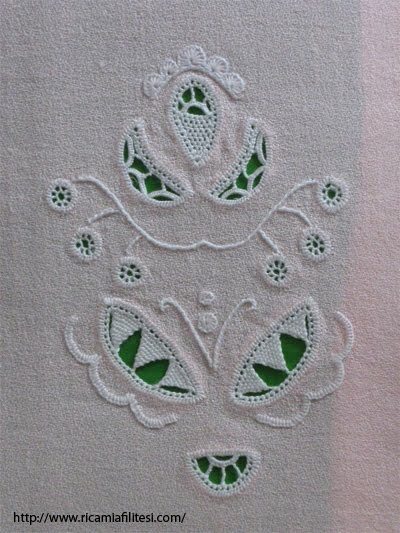 There are photos of some of the author's other embroidery works including an exquisite Macramé fringe and delicious Aemilia Ars needle lace though these projects are not explained in the text. All diagrams and patterns are very clear and easy to understand without a need for knowledge of the Italian language. Everything is in full colour. 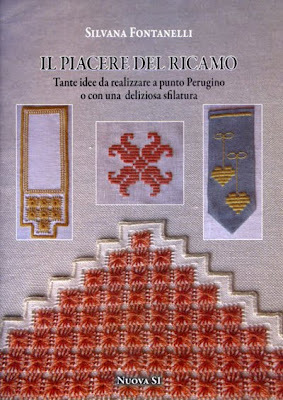 Elena at Italian Needlecrafts has this book available for purchase and you can see some of the inside pages that she has scanned to show you. We have talked about the different ways to use Punto Avorio which appears in several Italian needlework techniques like Puncetto needle lace. 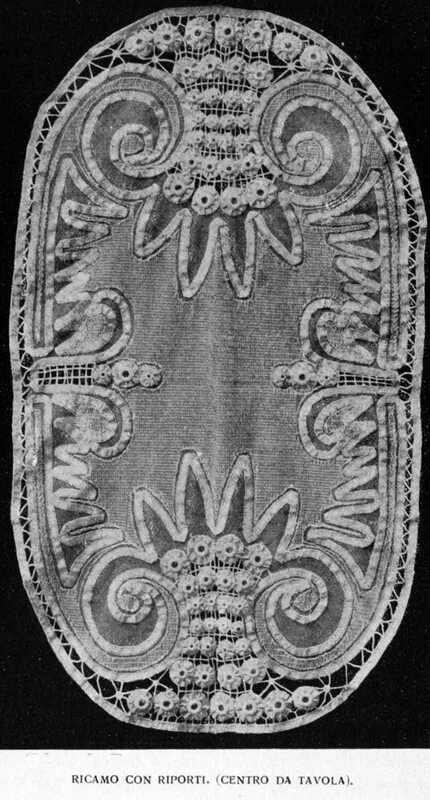 It seems to be executed in many different ways in Umbrian Embroidery. We saw it used as a filling – packed tightly together (inside the circle motif) and used for a design line – widely spaced (for the curlycue motif) and now as an edging which can then be used to join pieces of fabric together. Here we use Punto Avorio to secure the hem and to begin one of the motifs of Umbrian Embroidery called "Pignattina". For those of you who are curious: the fabric I'm using is Ivory-coloured Sotema 20L 38ct linen, a tapestry no. 26 needle and Ecrù-coloured (926) Anchor Coton a Broder no. 25 thread. While I was shooting the following photos this morning, the weather changed about 4 times, from dark, heavy clouds to pouring rain to sunshine to light clouds so I'm sorry if the lighting is so varied! 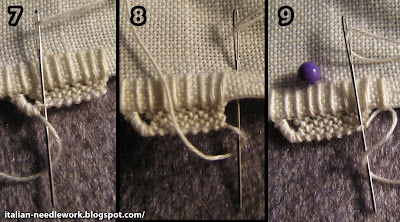 Here in photos 1 and 2, I did some Punto Avorio stitches along the hem going from left to right and then to do the Pignattina motif, I worked back toward the right slipping under only the threads in the spaces of the previous stitches. Click on the photos for a closer look. Going back, I did 7 Punto Avorio stitches, then forward again 7, back 7 and so on until I had five rows of 7 Punto Avorio stitches sticking out over the hemline. They form a little rectangle. You can get a better idea of the height of my rectangle from photo 4. At the end of my fifth row, I am on the left-hand side of my Pignattina motif. At this point I go down to my hemline and do another Punto Avorio stitch into the next open space to the left so that I get a little leg beside my motif (photo 3). In photo 4 I go back up and do another Punto Avorio stitch in between the first two stitches of my row so that now I have two legs. Back down beside what I did in photo 3, I make another Punto Avorio stitch to the left. Now I have three legs (photo 5). I cover the three legs together with 8 Punto Avorio stitches, working my way back up to the top left-hand side of my rectangle (photo 6). In photo 7 I start back across the top of my rectangle with another row of 7 Punto Avorio stitches. When I reach the right-hand side, I go down to my hemline and do another Punto Avorio to match the others along the hem. I now have a leg to the right of my Pignattina motif (photo 8). Back up to the top and another Punto Avorio stitch, like we did on the left-hand side, to make a second leg (photo 9). I will not, however make a third leg as I need to keep moving along my hemline to the right. Now I will cover my two legs with 8 Punto Avorio stitches (photo 10). When I reach the hem again, I continue on with my Punto Avorio stitches along the hemline until I want to make another motif. Note: I used a pin to tack the fabric down to my chair so I could take photos - it is not required for the stitching. In between Pignattina motifs, you can do a number of other things like these needlewoven picots called Pifferini. My tension needs work but it gets easier as you go on down the hemline. 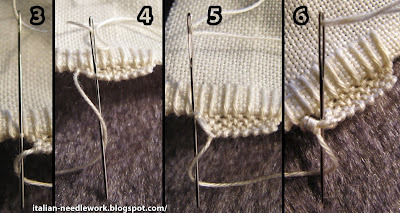 I basted my hem down and then after I was finished all the Punto Avorio stitches, I cut away my basting. You can leave these like this, or use them to attach your piece of embroidery to another piece. The Pignattine fill the channel between the two attached pieces. If I understand correctly, you attach the two pieces together while executing the Pignattina motifs of the second piece. I'm going to stitch up a second hemline and give this a try. I'll let you know how it goes. 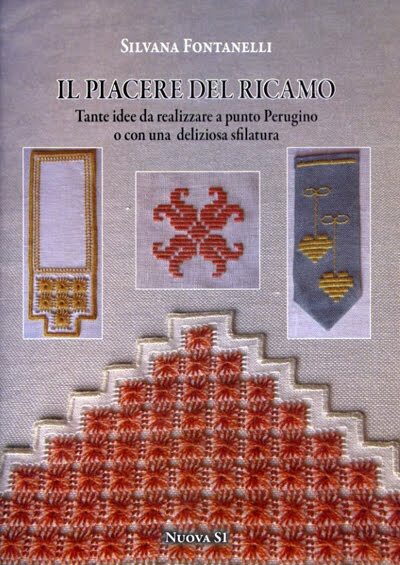 So many people wrote privately to tell me that I had misunderstood Punto Ricciolino used in Umbrian Embroidery that I thought I would do a post dedicated to correcting my errors. Thank you so much everyone for clearing up my confusion! When you try to figure out things alone at home, it's so nice to know when you've done something correctly or incorrectly! I do apologize to anyone who followed my previous photo sequence though I kind of like that stitch too. I wonder what it's called? I have done another photo sequence and although the stitch here looks very similar to what I posted before, the overall result is subtly different. Some of you asked what fabric and thread I was using, so it's Sotema 20L 38ct Ivory Linen with DMC Pearl Cotton no. 8 (colour 842) and a no. 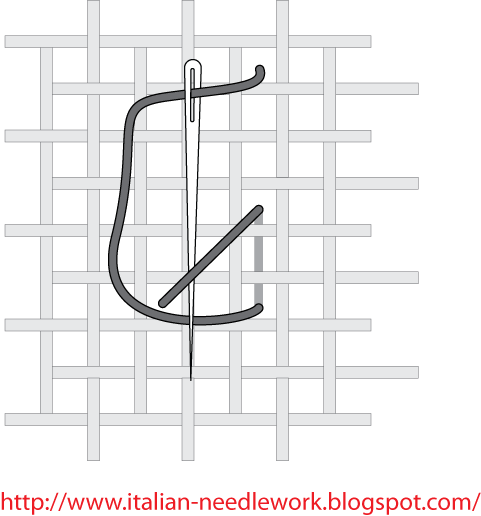 8 embroidery needle (sharp tip). I love the textural effect! I don't think I will cut out the curls I did on my little sampler as it will be too time consuming but I will definitely be doing more of Punto Ricciolino in the future! I will try to get back to working the edging to show you another way to use Punto Avorio in the near future, so watch for future posts. Apparently it is necessary for me to again point out to readers that I am not a needlework teacher nor an expert. These posts here on my blog are my own personal investigations. If you choose to follow my diagrams, photo sequences and/or anything else I do, you do so at the risk of misunderstanding along with me! An Italian woman from Perugia named Geneviève Porpora wrote to me with all kinds of links for finding out more information on Umbrian Embroidery. 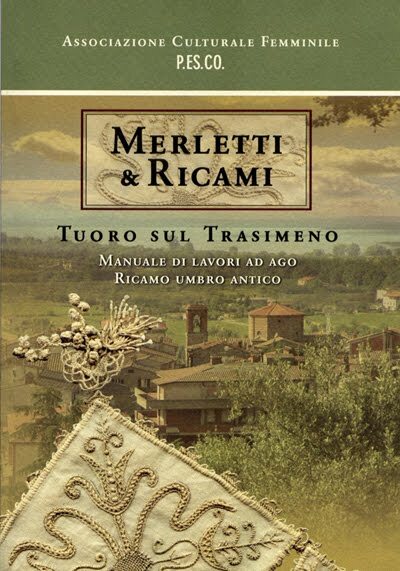 She wrote a book called Il Punto Umbro after having learned from the last surviving pupil (Margherita Biancalana) of the Marquess Romeyne Robert's "Scuola Ricami Ranieri di Sorbello" [Ranieri di Sorbello Embroidery School]. Unfortunately most of the links that she gave me are in Italian and seem to be often broken or leading to pages which no longer exist. If you would like more information, please contact her directly through her email address. I'm sorry, I've been very busy and unable to post for days. 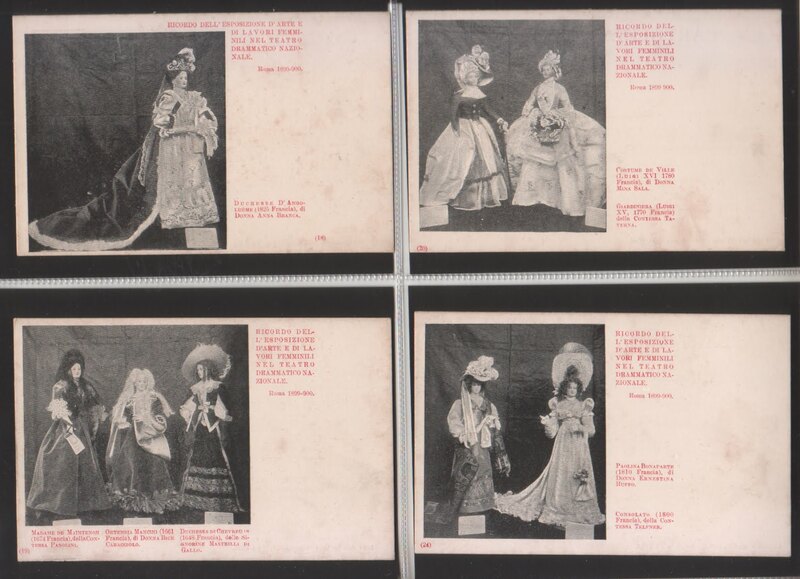 It may be a couple more days before I can get caught up so in the meantime, I want to share some photos with you which were sent to me by the fabulous Claudio at the Ning group MI1906 of postcards that he has in his collection. Claudio tells me that there must have been at least 40 postcards in the series, so far he has collected about half that amount. 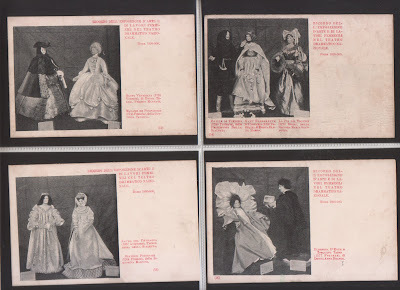 The postcards all read: Ricordo dell'Esposizione d'Arte e di Lavori Femminili nel Teatro Drammatico Nazionale [Souvenir of the Exposition of Art and Feminine Works in National Dramatic Theatre]. Rome 1899-1900. The only thing I can find on the exposition is in the biography of an Italian writer named Amelia Pincherle Rosselli (1870-1954). She was a member of the committee for the exposition. The Fondazione Rosselli has a listing of her personal papers online to peruse and it is here that I find the exposition "inaugurated on April 3, 1902" at the Hotel Suisse in Rome. Since these dates don't correspond with the postcards, I wonder if there was another expo? Unfortunately only some of the documents are online. I will post more at a later date after I have researched some more into this. Deepest gratitude goes to Claudio once again for the photos! 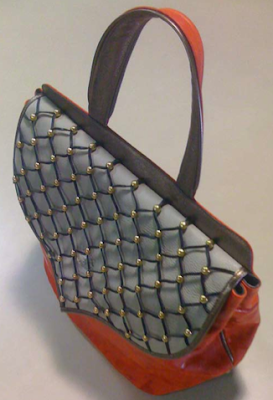 Anna Castagnetti of Ricami a Fili Tesi in Verona has opened up her own website! Click on the British Flag for the English version and have a look around. On the "Courses" page, be sure to click on the title of each technique that Anna teaches (so many!) to see photos of her beautiful needlework. Contact her (anna.castagnetti@ricamiafilitesi.com) if you want to bring a small group to Verona for classes. This is my favourite option: Art-embroidery courses. Besides teaching your selected technique, Anna will take you around Verona to see important artistic sites (yes, she speaks English!). This I can tell you is fantastic. Anna and another lady from Mantua took me to the Don Mazza Museum in Verona and I have to say, if you love needlework and are in Verona, you shouldn't miss this little place. 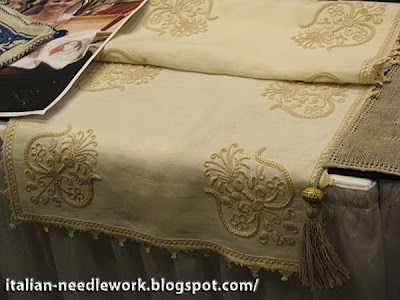 I have posted many times about the needlework in this museum and I still haven't showed you half of what is there. 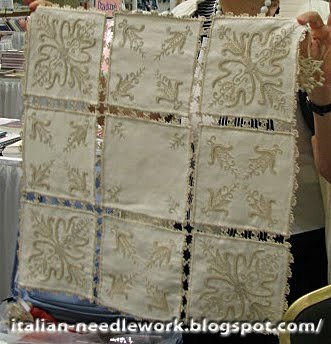 See Italian Stumpwork, Embroidery on Tulle in Verona, Fine Italian Whitework and Samplers. Also to check out on Anna's website is a free Stumpwork project to download (instructions in English!) on the "Projects" page. Included in this project are the instructions for those lovely tassel-buttons used on many different types of Italian needlework. The pdf file is loaded with excellent close-up photos. 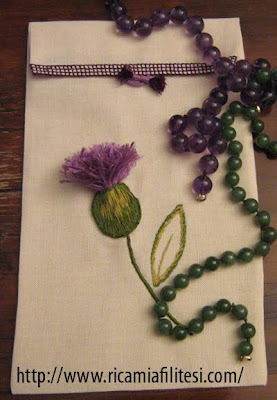 You can read more about Anna and her needlework here and here. 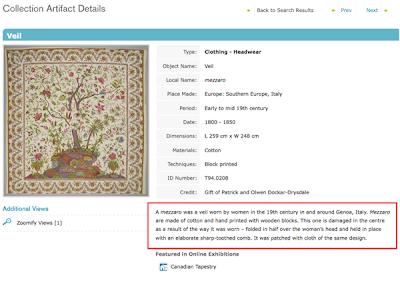 Some days ago I read of the Textile Museum of Canada's online collection at the Needleprint Blog. I went right away and put "Italy" into the search engine and was delighted to get four pages of results with a total of 46 pieces to look at. 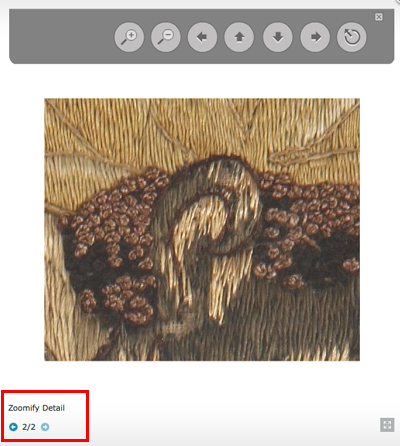 If you're going to look at these or other images on the website, I noticed some things (indicated in red boxes). Just a small but important point to clarify regarding yesterday's post. The Lombardy Regional Exposition for the Decorative Arts of 1919 was organized by the Humanitarian Society of Milan and held at their premises. This exhibition was a prelude to the Decorative Arts Biennials of Monza, Italy held in 1923, 1925, 1927 - becoming a Triennial in 1930. The exhibition would then transfer to Milan in 1933. The Triennial of Milan is still held today. I have been organizing material for both the Monza Biennials and the Milan Triennials to tell you about so look for that in future posts! Much thanks to Claudio at the Ning Group MI1906 for the additional info!! In 1891 in Milan, entrepreneur Prospero Moisè Loria (1814-1892, originally from Mantua) proposed the idea of a Humanitarian Society as he was disturbed by the differences of extreme poverty and extreme wealth of the population in Milan at the time. He offered the city an annuity to set up the society but the idea was rejected. He then left instructions in his will (and 10 million lire!) for it to be realized after his death, hoping for recognition that there was a real need for change in Milan. His descendants contested the will but eventually his dream was realized. The Humanitarian Society was based in Loria's home and would become one of the most important institutions in Milan. Programs for education and training for employment were carried out and in 1906 and 1909 separate locations were set up for encouraging the skills relating to the Arts and Crafts resulting in 1905 in an embroidery program taught by Adele Sottili (under the name Adele Sottili Calori, she would later publish at least one book: L'arte nei lavori femminili. Cifre monogrammi per ricamo. [Art in feminine works. Monogram Ciphers for Embroidery] - I can find one copy at the Libreria Naturalistica in Bologna if you have a spare 180 euros!) Eugenia Volpi is listed in the Society's archives as an assistant in the festival section of embroidery, 1906-07; Elisa Cantoni is listed as an assistant for courses of design and embroidery in 1915 but I can't find any other information on them. In a 1916 issue of Emporium (Vol. 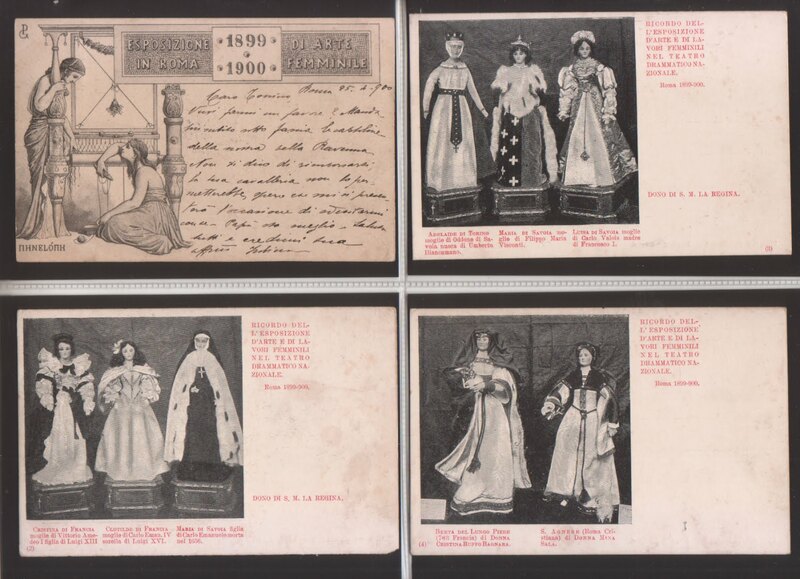 XLIII, n. 254) I found an article by Alfredo Melani with lots of photos of the needlework produced by the Humanitarian Society. The designs reflect the period and there are many techniques employed, sometimes all on one piece! 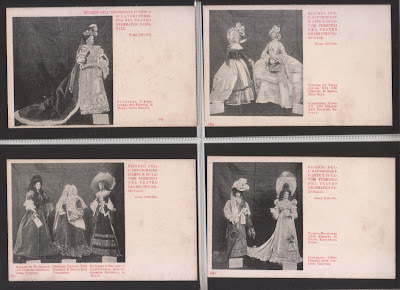 The Emporium article talks of courses in the women's section on embroidering household and personal linens (white on white) and on "luxury" embroideries (using coloured threads), on tailoring and even one on ironing! The Humanitarian Society was bombarded in 1943-44 and many of the sections including the women's sections were completely destroyed. The courses on sewing and embroidery were not back up and running until 1947. 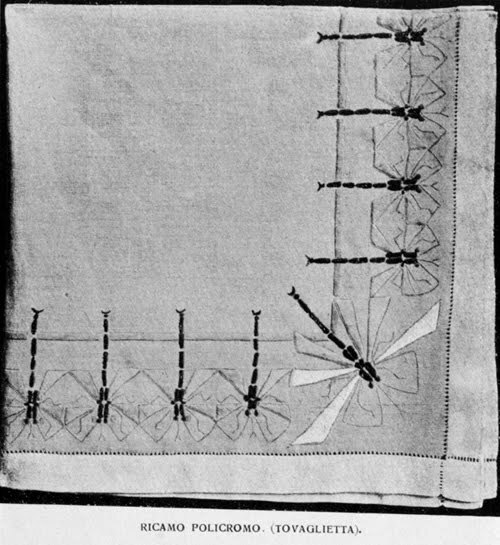 However, the times were changing and by 1965, traditional domestic activities for women were passé and courses in needlework were no longer viable. The Humanitarian Society still runs today with programs in Decorative Arts though I could find no evidence that needlework was among them. Check out their website for lots of information (in Italian). 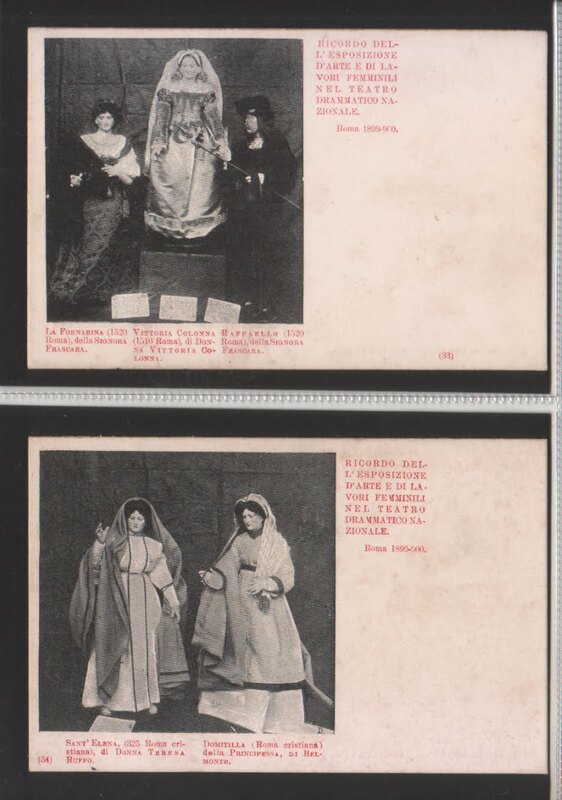 Special thanks to Claudio from the Ning group MI1906 who brought this bit of Milan's history to my attention and kindly donated the scan from the catalogue! 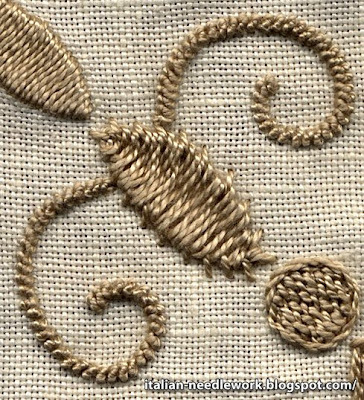 Continuing our look at Umbrian Embroidery (Part One, Part Two and Part Three) today we'll have a look at Punto Avorio [Ivory Stitch] which we have talked about before when referring to Puncetto needle lace. 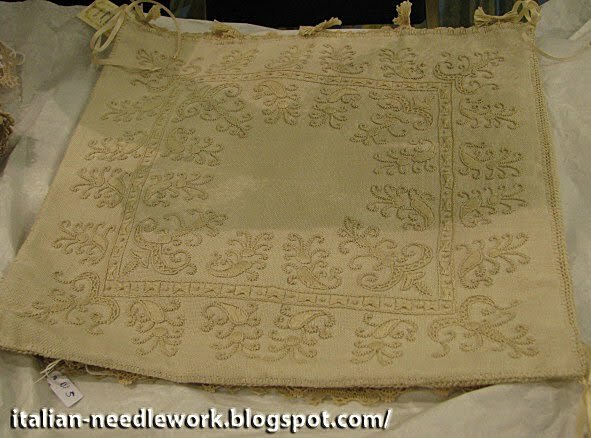 You will begin to note some similarities in the influences on needlework in Italy. Punto Avorio is used in Umbrian Embroidery which was created from studying ancient Arab embroideries and Puncetto needlelace is thought to have come to Italy through Arab influence. Both Punto Avorio and Punto Ricciolino (which we looked at yesterday) are mentioned in a pamphlet from Marquess Romeyne Robert's Arti Decorative Italiane shop. 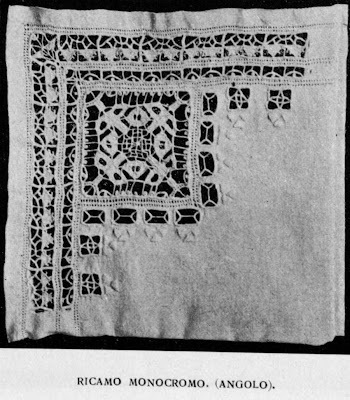 "The specialty of the School [Ranieri di Sorbello Embroidery School] is a knotted raised stitch of which there are many variations... to augment the effect of its embroidery, the School often uses inserts of Ivory Stitch which is one of the oldest needle lace stitches also brought to Italy by the Arabs. 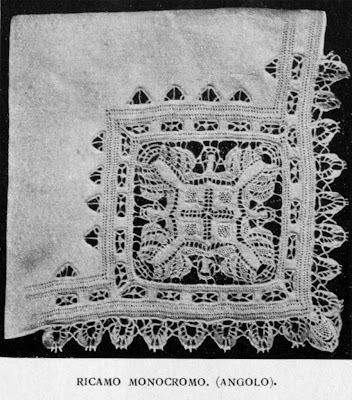 It is called Ivory Stitch because the lace motifs were copied from the ivory grates used in front of the windows of the harems. 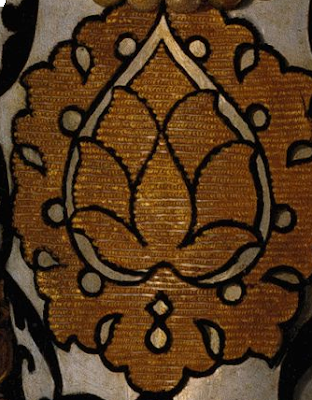 Although the stitches are Arab, the designs are Italian from the Renaissance period and the whole character of the work is Italian [referring to Umbrian Embroidery]." 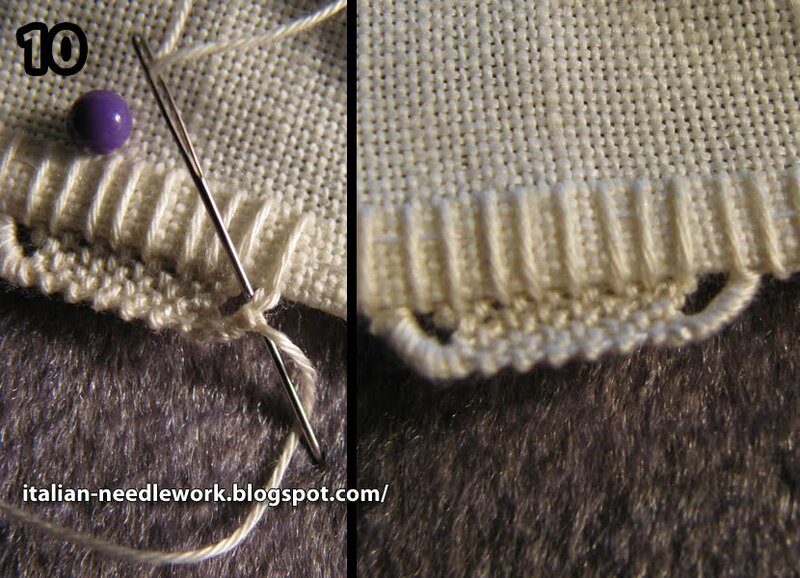 It is a nice stitch for the curlycues as it creates a raised line and also as a filling stitch as it is very compact. When I get to finishing the edging of the sampler, I'll show you some more characteristic ways that Umbrian Embroidery uses Punto Avorio. The difference in execution of Punto Avorio is also interesting. 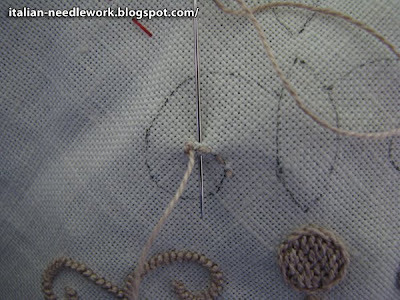 In Umbrian Embroidery, it is done with the needle going towards the embroiderer (as in the photo above) but in Puncetto needle lace it is done with the needle going away from the embroiderer. Check out some of the antique Umbrian Embroidery collection at the Palazzo Sorbello or a modern interpretation here and here. 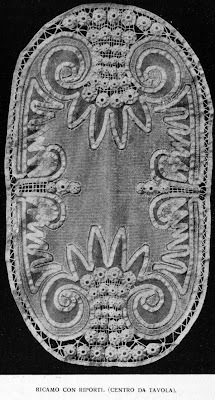 If you are just joining us now, we started looking at Umbrian Embroidery here and continued here. As previously stated the Marquess Romeyne Robert and Carolina Amari based the technique of Umbrian Embroidery on some antique Arab embroideries in the personal collection of the Countess Edith Bronson Rucellai of Florence. I have been exploring my little book from the Associazione Culturale Femminile P.ES.CO. mentioned previously. 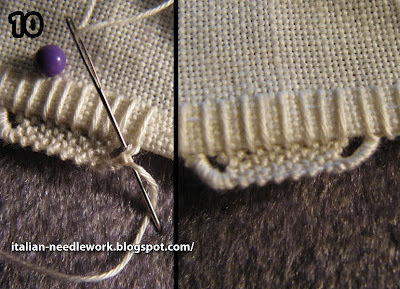 Correction: I did not interpret this stitch correctly! 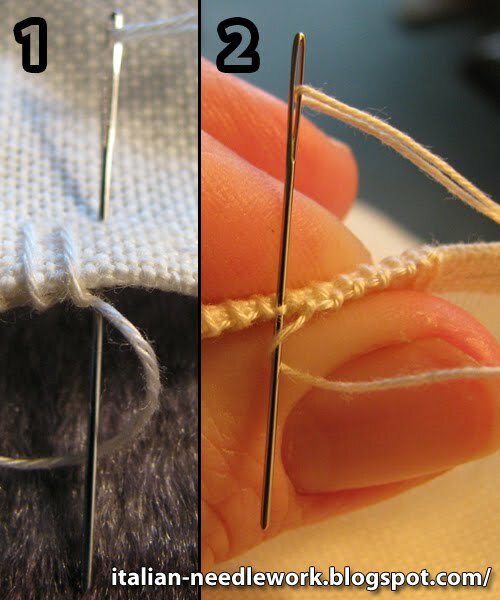 Please click here for the correct way to execute this lovely stitch! 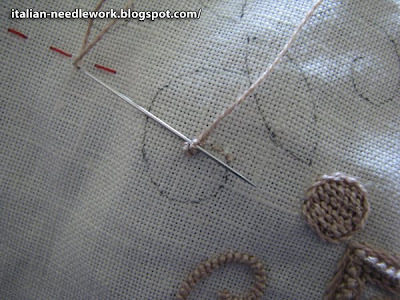 This is a particularly attractive stitch for curved lines, giving a raised effect that I really like! I'm doing a little sampler and will go over the other stitches in a future post. I have taken some screen shots of the homepage to point out some things to you. The first thing that I noticed upon arrival at this website was how modern and "young person-savvy" it was. Almost too much for me! At the top are links to various social networks - some I know of through my daughter like Stumble Upon, Twitter and Facebook and others I had never heard of like Technorati, Delicious and Digg. This makes Filiforme something totally new - needlework aimed at young people. An exciting concept for those of us who have been wracking our brains trying to figure out how to interest this elusive age group in the art of needlework. For now the Filiforme website is only in Italian, but with the aid of Google translate you should be able to navigate around fairly well - I tried it and some of the translations made me laugh out loud but I was able to find everything. The first section announces upcoming classes and exhibitions with some in-depth information and a couple of photos of examples just below. 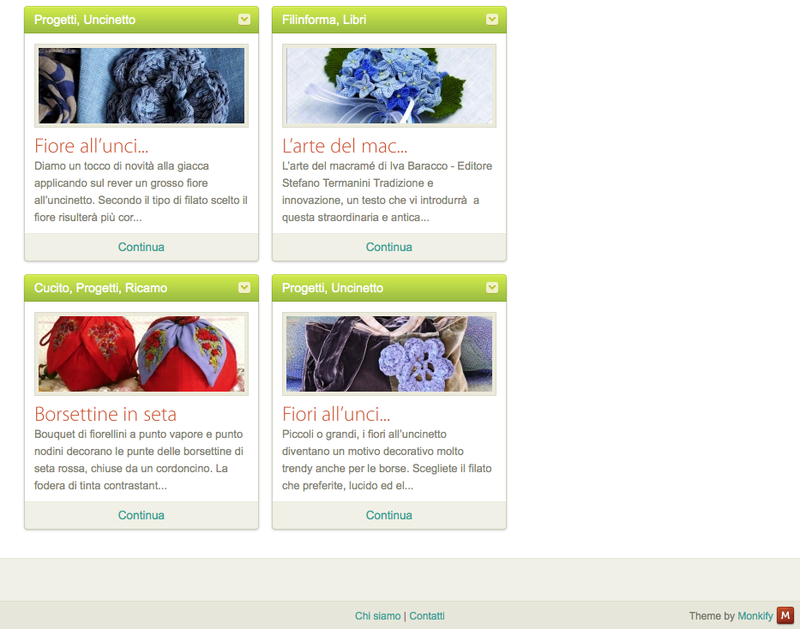 Below the embroidery projects, the same format then for three crochet (uncinetto in Italian) projects: a scarf, a purse and a flower brooch. Here there are also links for downloading the clearest diagrams. After that a recommendation for a delicious book on unusual macramé and how to purchase it. Then a sewing (cucito in Italian) embroidery project for a silk bag. This is by Patrizia Recchia of Mano di donne - make time to check out her funky website with a decidedly "young" flavour. More crochet flowers with a different application finish up the homepage at this time. If you explore the pull-down menus at the top of the homepage you will discover under the tab: "Fili insegna" the page "Punti di Ricamo" which has 10 diagrams and instructions for embroidery stitches and if you click on the "Older" button, you find five more! The tab: "Fili informa" has listings for more courses, exhibits and other news (look for Paola Cellini's prize-winning entry at the Valtopina show stitched on doubled organza!) as well as more book recommendations. 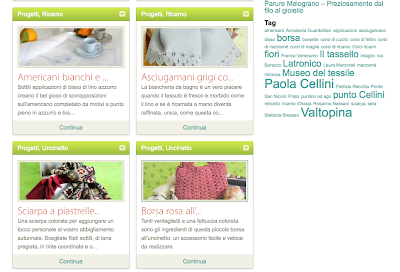 The tab: "Progetti" takes you to a listing of the needlework projects found on the Filiforme website (moving forward, I expect there will only be the latest projects on the homepage and you'll have to come here to explore past projects). 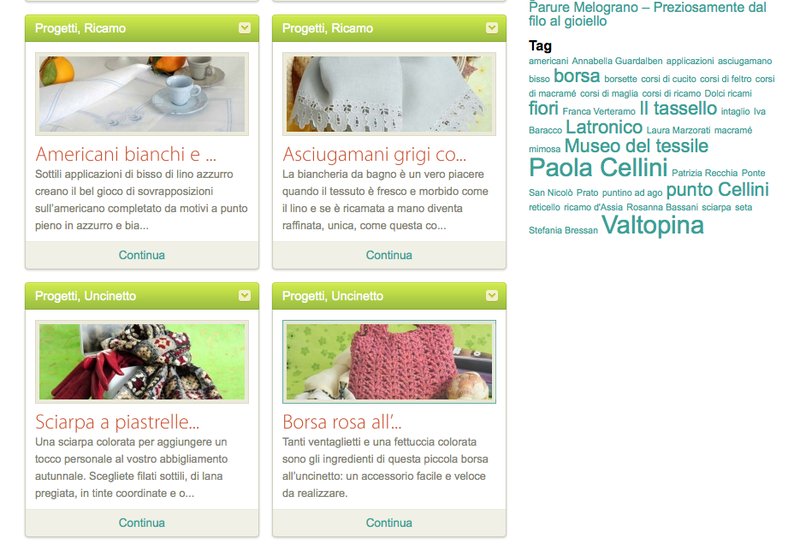 At the bottom of the homepage are two small links "chi siamo" and "contatti". 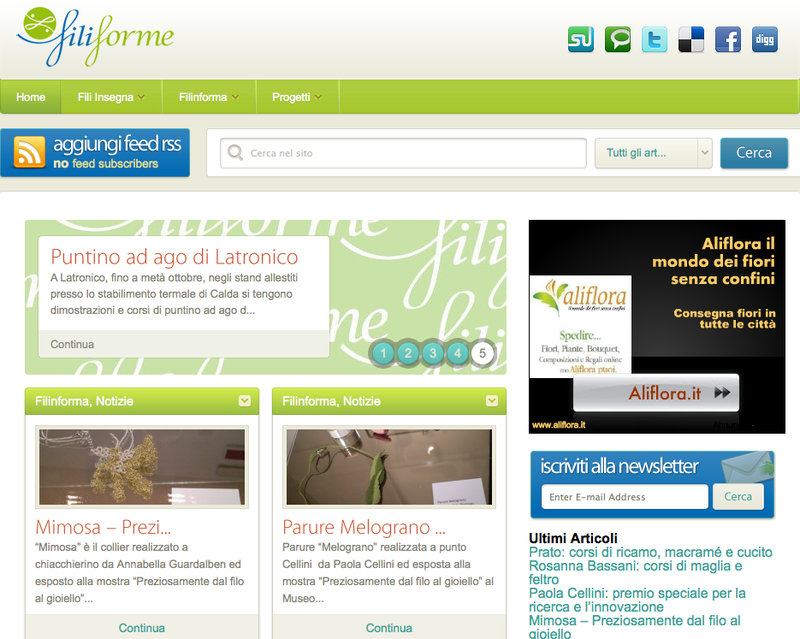 "Chi siamo" means "who we are" and "contatti" is the contact page. You may be surprised to find that there are only three Italian women behind all this work. The only one I know of personally is Stefania Bressan who was my first contact in the world of Italian needlework nearly a decade ago. 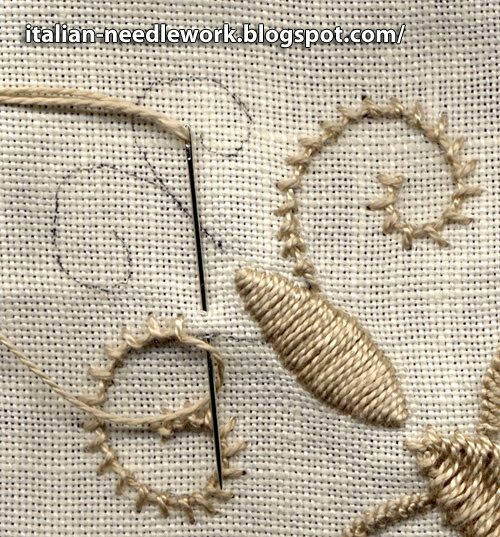 A needlework teacher in northern Italy, Stefania is also the author of a book on Schwalm Embroidery and collaborated on the recent release of the Drawn-Thread book I told you about here. As I understand it, Laura is the photographer and her photography is exquisite and attractive lending a professional look to both the website and the projects. I don't know anything about Francesca - I hope that biographies will eventually appear on the Filiforme website as I'm always fascinated in the people behind the work. One important thing to mention: the women are looking for feedback and input, so send them your comments, suggestions, news and events. I don't know how often this website will be updated but I signed up for the newsletter and I'll keep you posted! Go before January 23rd, 2011. At the Palazzo Strozzi right now is an historic event: Bronzino - Pittore e Poetica alla Corte dei Medici. 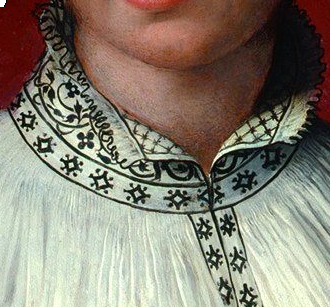 [Bronzino - Artist and Poet at the Court of the Medici]. This is a monumental show. The first ever collection of Agnolo di Cosimo or Bronzino's paintings (with other works by Pontormo, Cellini, Tribolo, Baccio Bandinelli, Pierino da Vinci and Alessandro Allori). These painters were fantastic not only for their talents as painters but also for their attention to embroidery and lace details. 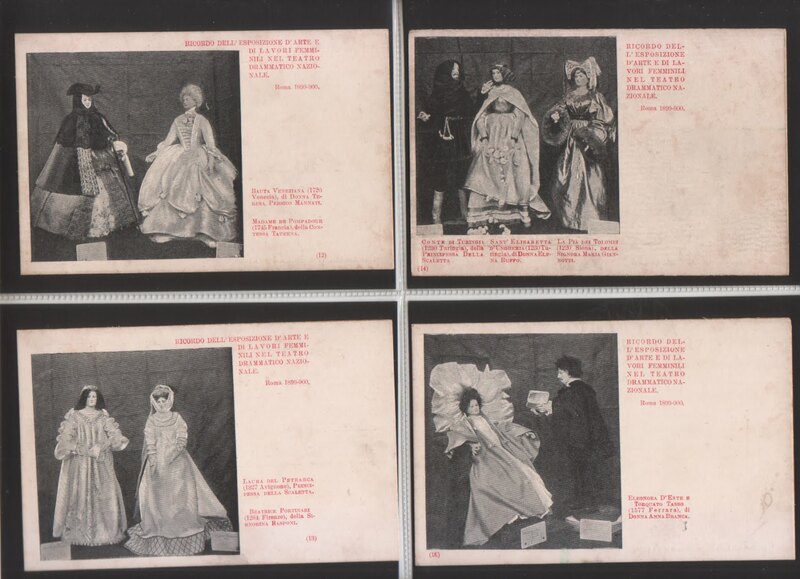 Anyone interested in period costumes will be delighted as well. On the Palazzo Strozzi's website, for those of us who will not be able to get to the show, are a few paintings with the availability to zoom in for close up views - closer than you might be able to see even at the show. 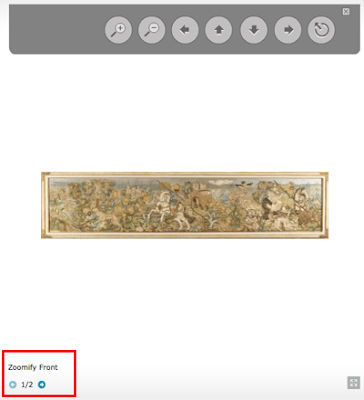 Click on each section to see a few paintings from each grouping. There are painting at this exhibit on loan from the Uffizi (the part now closed for restorations) and museums in Budapest, New York and Paris. Go here for a short video (in English) as well as a review of the exhibit. And then here for a video in Italian, worth watching even for those who don't understand as there are lots of views of paintings! There are also tapestries designed by Bronzino, Pontormo and Salviati. 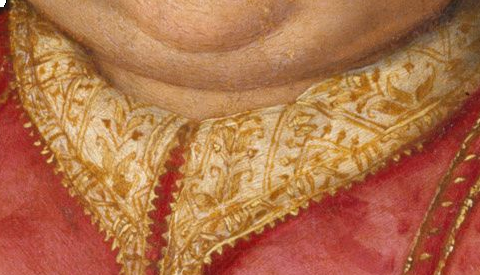 Go to the publications page of the Palazzo Strozzi's website and download the Passport to Bronzino to read all about everything available (in Italian and English). If you're going... can you take me with you?! 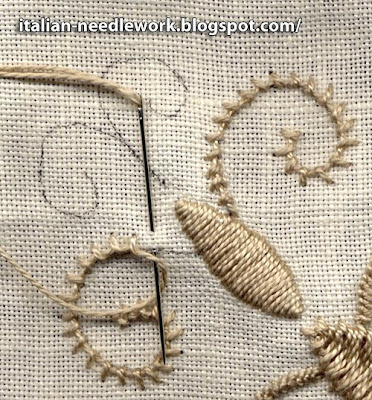 Just to follow up on my post about this year's Sansepolcro Lace Biennial - please visit Mena's blog: Tombolo e altro for some photos and a run-down of her experiences, there is also a second post with more photos and *gasp! * a MAN doing bobbin lace! The blog is in Italian, so you might need to run it through Google Translate. 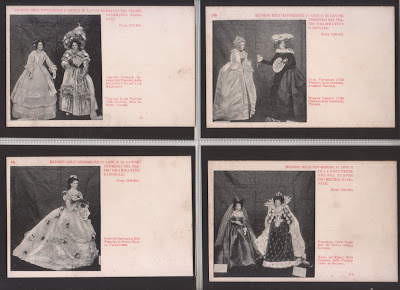 There are some photos of the exhibition and a few of the lace masters. 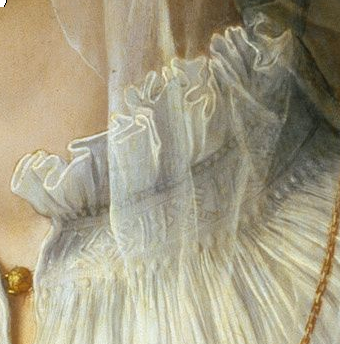 Click on the photos for close-ups, don't miss the banner with the Renaissance lady - she has applied lace and leather on her gown! There is a bit more here (in Italian) about the event and the winners. Canadian lacemaker Lenka Suchanek also took a prize, you can see her piece here. If anyone knows where there are more photos of this event will you post below? Let's continue on with our investigation of Umbrian Embroidery. If you're just joining us, please start with Part One. The embroidery school/workshop founded and run by Romeyne Robert, Marquess Ranieri di Sorbello with the able management and outstanding input of Carolina Amari enjoyed ever-increasing success from 1904 until about 1933 or 1934 when both the school/workshop and the Arti Decorative Italiane shop in Perugia closed. It seems a number of factors were involved in the closures, most likely being the economic difficulties of the times and the advancing age of the two ladies. 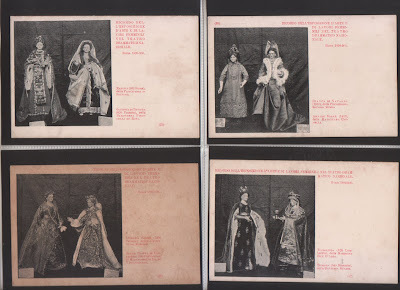 After the closures, the Marquess Romeyne exhibited a collection of the very best pieces from the school/workshop in the Palazzo Sorbello and went on to collect antique pieces of embroidery and textiles. 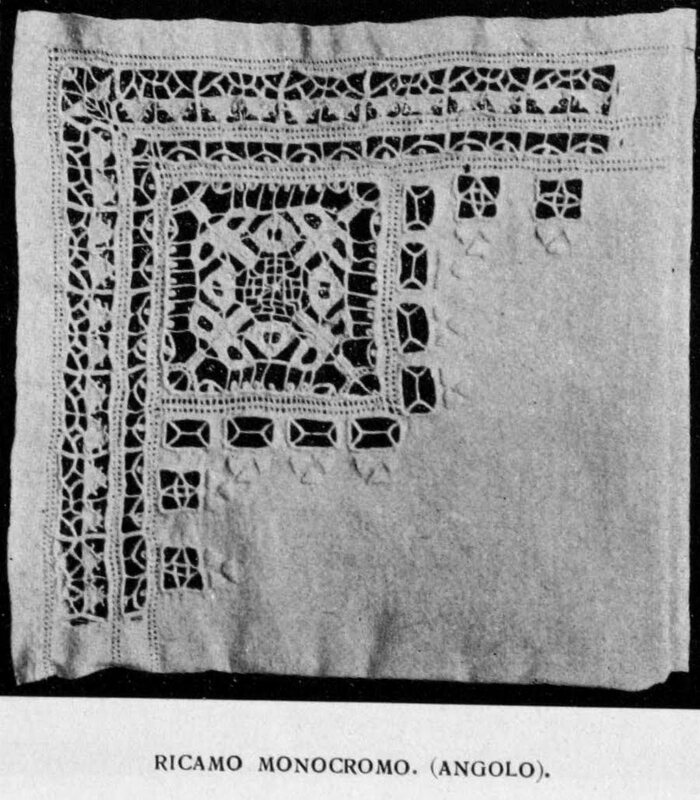 Some students continued to make Umbrian Embroidery and later to teach it to others. 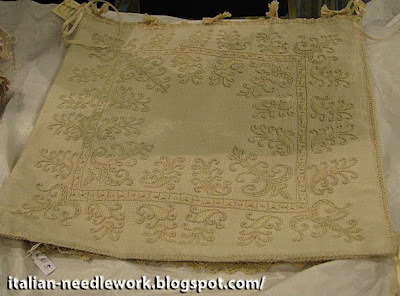 In the late 1990s a renewed interest in this needlework brought about a revival which still continues today. There are now a few embroidery schools in Italy who teach Umbrian Embroidery. A small format book of about 50 pages, it has technical instructions of most of the stitches which define the technique of Umbrian Embroidery including how to do some of the tassels. The text is in Italian but there are lots of clear diagrams. I've had a bit of success trying it out, though, like any other embroidery technique, you must practice in order to perfect stitch tension. 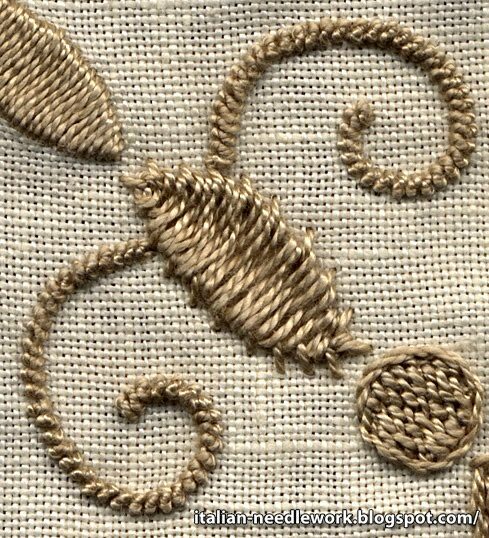 Some of my attempts are quite sad so I would really like to take a course in this needlework - I am especially attracted to it's tone-on-tone texture. 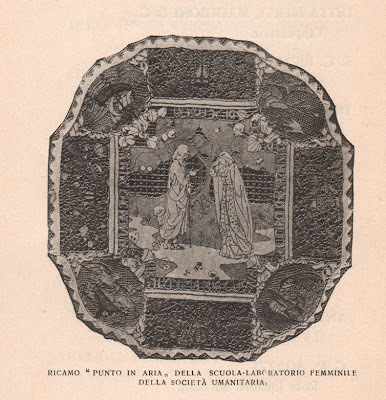 At the EGA Seminar in San Francisco, the Italian ladies brought some pieces of Umbrian Embroidery from the P.ES.CO. Association with them. The pieces were spectacular! The P.ES.CO. Association's goal is the "defense, conservation and dissemination of the artistic, artisan and cultural traditions of the area". They also promote the local art of Crochet Lace which we will talk about in another post. This is a group of astonishingly talented women. They keep a permanent exhibit at the Palazzo del Rondò in Tuoro sul Trasimeno in the province of Perugia if you happen to be passing by. 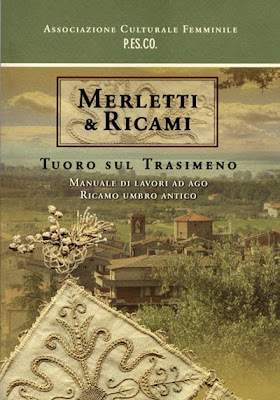 The book is available directly from their website if you are in Europe, otherwise to pay with PayPal, check out Tombolo Disegni (click on Libri/Books, then Libri/Ricamo, then Ricamo Italiani - send an email request to order). 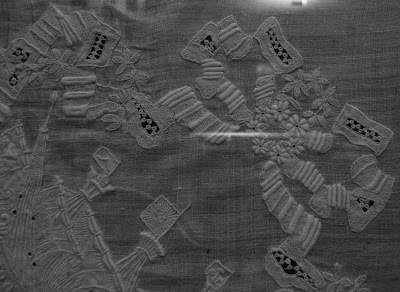 Next time we'll have a look at some characteristic stitches of Umbrian Embroidery.